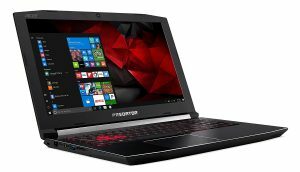 Black Acer Predator Helios 300 (G3-571-77QK) is the latest 2017 model VR ready advanced gaming laptop with a modern design, high-end specs like the powerful GTX 10 Series 1060 6GB graphics card, 15.6 inches Full HD non-touch screen with an IPS panel and up to 7 hours of battery life, easy upgradeability and more. The Kaby Lake quad-core Intel i7-7700HQ processor with a Passmark benchmark score of just under 9000 indicates great power and ability to handle the advanced tasks. The speed goes from 2.8GHz to 3.8GHz with turbo boost and the four cores can handle eight threads in parallel thanks to the hyper threading. 16GB DDR4 memory at 2400MHz offers a lot of multitasking power for a great percentage of computer users and is offered as 2 x 8GB and you may upgrade it to 32GB if you need more memory. There is no standard, large size HDD hard drive on this model but a 256GB size Solid State Drive with much more speed for opening files, starting and shutting down the system way faster than normal. You’ll also find a 2.5 inch HDD slot included so you can install a regular HDD for a large storage space. It supports both the M.2 SATA and M.2 NVMe. You have the dedicated access panels for both the memory and hard drive upgrade without having to disassemble everything. Putting in an HDD will not void the one year warranty on this machine as long as there is no damage. If damage occurs you’ll need to pay for it but the warranty will continue after it is fixed. The Windows 10 operating system on this model also offers faster boot ups and shut downs than normal and includes some user-friendly features that make it the most preferred Windows OS so far. The NVIDIA GeForce GTX 1060 with a 6GB of dedicated GDDR5 video memory has an impressive video card benchmark score of 8687 that puts it in the top 20 of all GPUs in the world. So you can certainly play all the latest games at higher settings and resolutions at more than acceptable frame rates per second. 15.6 inch Full HD widescreen matte LED-backlit display has the 1920 x 1080 pixel resolution for very sharp and clear images when you’re playing games. It has a 60Hz refresh rate and does not support Gsync. The IPS panel (In-plane switching) offers up to 178-degree viewing angles both horizontally and vertically and the color gamut is specified as 45% NTSC. The TrueHarmony Technology Sound delivers very decent sound through the two integrated stereo speakers. 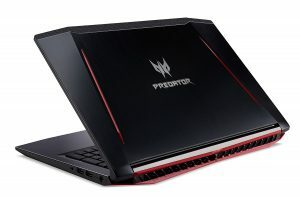 Black Acer Predator Helios has an aggressive gaming design in textured metal form with red accents and geometric lines, weighs just under 6 pounds and measures 15.35 x 10.47 x 1.05 inches. Battery life from its 4-cell lithium ion battery (3220 mAh) is up to 7 hours in regular things like web browsing and video streaming, which is pretty good for such a powerful gaming laptop with FHD display. It has a red-backlit keyboard with responsive keys with nice travel, a separate numeric pad on the side and an intuitive trackpad that requires you to push a little harder to get things done. It is often better to connect a wireless mouse than dealing with touch pads. It has a high-definition webcam that supports HDR- High Dynamic Range with a 1280 x 720-pixel resolution High Dynamic Range, that you can use for gaming with others and Skype chats. Connectivity options include the latest 802.11ac WiFi with 2×2 MIMO technology of 2.4GHz and 5GHz, Bluetooth 4.0 (not the later Bluetooth 4.1) to connect to other Bluetooth enabled devices, 10/100/1000 Gigabit Ethernet LAN with RJ-45 connector, Secure Digital (SD) Media Card Reader, a USB 3.1 Type C port with up to 5Gbps data transfer speed, a USB 3.0 port with the Power-Off charging feature, 2 x USB 2.0 ports, an HDMI output with HDCP support. Acer Predator Helios 300 (G3-571-77QK) runs relatively quietly and stays cool even at very high load with the efficient dual fans and great thermal management. And everything seems to run at the optimal performance so you enjoy smooth gaming at all times. We can only see minor cons on this unit, such as the weight of the unit, Bluetooth is 4.0 rather than the later 4.1 (but this is so insignificant) and the smaller size of storage. Otherwise, this is a great value computer that is very capable for all kinds of tasks, with plenty of power, speed and connectivity options. It is easy to set up and run and comes with no junkware that you need to uninstall.